The analysis of bicarbonates allows, in a simple and fast way, to quantify the concentration of the analyte in the water used in the brewing process. 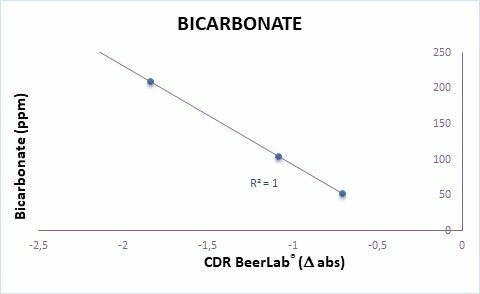 bicarbonates levels in the water used in the brewing process can be measured using CDR BeerLab®, a system which enables you to carry out a wide panel of chemical analyses on beer and water, using a single instrument, in a process that is faster and simpler than traditional methods. With CDR BeerLab® brewers and breweries of any size can independently carry out brewing process controls without having to rely on external laboratories. Time testing: one test 10 minutes. The calibration curve was constructed using standard bicarbonate solutions. The trend of the curve confirmed an excellent linearity of the system over the whole measuring range. The bicarbonate ion reacts with an enzymatic complex that leads to the oxidation of NADH. The decrease in absorbance measured at 366 nm is proportional to the amount of the analyte present in the water sample. The reagents are packaged in foil pouches containing 10 tubes useful to perform 10 analyses. This is the minimum package that allows the use of CDR systems even to those who need to make a few analyses, thus not wasting reagents. There are also boxes of 100 tests, however, packaged in 10 bags of 10 tubes containing the reagent. The reagents have a shelf-life of 12 months. Bicarbonate in Water was last modified: February 22nd, 2019 by CDR s.r.l. Neither skilled staff nor a dedicated external laboratory is needed to use our systems. CDR FoodLab® optimizes traditional testing methods, making them faster and easier, while guaranteeing accuracy standards in line with the reference methods. Reagents come in aluminum packages containing 10 test tubes each to perform 10 tests (or packages for 100 tests containing 10 single packages of 10 test tubes each). Just a few steps will suffice to carry out your analysis in a rapid way in total autonomy. The system is composed of both the analyzer based on photometric technology and a kit of low toxicity, pre-vialed reagents, developed by CDR. CDR FoodLab® is cost-effective because it does not require the use of expensive equipment and does not entail maintenance, assistance or calibration costs.